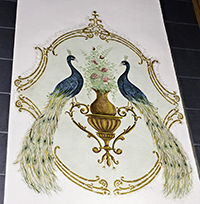 For nearly 84 years, vintage artwork in The Sherman Theatre lay hidden under successive renovations, awaiting rediscovery. Finally, in 2013, they were ready again for their close-up. The original Sherman Theatre opened August 2, 1926, as a silent film/vaudeville theatre. The walls were painted with woodland scenes as befitted a movie palace. A January 21, 1928, fire destroyed the building's stage end on the east wall. The wall and roof collapsed into the alley. Even though it was quickly brought under control, the fire damage was extensive. The heating system was blamed for the fire. The owner, Ernest E. Sprague, decided to rebuild the theatre and make it even more spectacular. The woodland scenes were replaced by twin peacocks and roses, illuminated by wall sconces. By the following year, "talkies", movies with sound, were being released and the theatre was retrofitted for sound. The Celotex Company removed the theatre auditorium's metal ceiling and covered the walls with its sound-absorbing tiles and panels. Celotex had a stone-like appearance, like castle walls. They made arches which surrounded the peacocks. They filled in the arches with more Celotex. The peacocks and roses disappeared from view after only a year. One of the workers installing the Celotex wrote his name in pencil on one of the peacock panels. The writing is not visible from the floor. As part of a 1968 remodel, the sconces were removed. 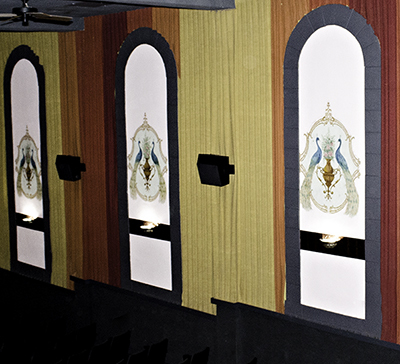 The theatre installed Soundfold fabric over the walls in 1969 or 1970. The art was not seen again until 2013 when Owner David Branda decided to find the auditorium's original wiring and replace the original sconces. He had read about the 1928 repairs in the newspaper accounts. "I assumed they were still there, but did not know the size, design or exact locations. It was when I was removing the Celotex (around the middle of January) trying to find the wiring that I uncovered part of a peacock's tail. That is when the fun began," he said. When the Soundfolds and Celotex were peeled away, the peacocks were revealed. The metal-colored strips behind the new sconces is in homage to the theatre's original tin ceiling. 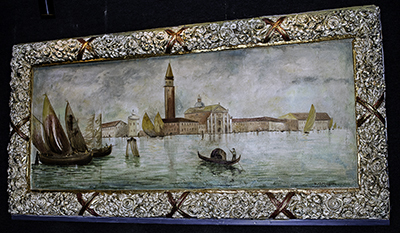 The same artist who painted the peacocks, A.D. Maggiora, also painted a scene from Venice on the back wall, with assistance from T.C. Herran of Denver. Maggiora signed and dated the painting at bottom right. The ornate frame was made of plaster. That mural also disappeared beneath the Celotex. The frame remained uncovered but Celotex filled the interior. Laurie Albin of WaKeeney restored the painting in 2008. She filled in nail holes and "brightened up" the painting's colors. She added highlights and gold leaf to the frame. Branda met Albin when she was painting "Bygone Days on the Bricks". See the theatre's website for movie start times, usually at 7 Mountain Time, and come early to see the paintings. Stop at the concession stand first for reasonably priced snacks and use the coupon for more savings. Gift certificates are also available at concession stand. For more murals, see "Rural Free Delivery" in the Goodland Post Office and "History of the Opera House" at 10th and Main. Carnegie Arts Center and its victory for women's rights stands one block to the west.